When a driver is arrested for DWI in New Jersey, there are many concerns and questions that will arise as to how the process will go and the best way to achieve a positive outcome. 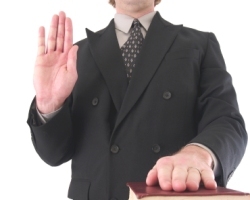 Some of the most frequent questions that come up have to do with testifying at trial. Many factors come into play such as whether or not it’s a good idea to testify in the trial, how to prepare for the testimony, how to behave during the testimony and what kinds of questions will be asked. Part of a defense attorney’s job is to examine the evidence in the case and to prepare the defendant for testimony. When a driver is stopped by law enforcement on suspicion of DWI in NJ, the officer must have a legitimate reason for making the stop. That could be witnessing the driver swerving in and out of traffic, breaking traffic laws, speeding, driving too slowly and many other questionable actions. It could also be made if another driver saw the vehicle behaving erratically and contacted police. Once the stop is made, the officer will speak to the driver and look for telltale signs of intoxication. An obvious one is an open container of alcohol in the vehicle. Other signals include bloodshot eyes, slurred speech and the smell of alcohol. After that, the officer will ask the driver to submit to field sobriety tests such as the Walk and Turn test and the Horizontal Gaze Nystagmus test. Next, there will be a breath test to determine the blood alcohol content. The officer must watch the driver for 20 uninterrupted minutes to ensure nothing is done – chewing gum, smoking a cigarette, regurgitating – to compromise the accuracy of the test. When the breath test is given, if the driver registers over a certain level, there will be an arrest made for DWI. For a driver over the age of 21, the BAC to warrant an arrest for DWI is 0.08%. If the driver is under 21, the level is 0.01%. If it is a commercial driver, the level is 0.04%. Once the arrest is made, the driver will be confronted with a variety of punishments if convicted. Depending on the number of times that the driver has been convicted of DWI and the BAC level, the penalties can grow in severity. For a first offense DWI with a BAC of 0.08% and below 0.10%, there will be a fine of between $250 and $400. There can be a jail sentence of up to 30 days. There will be an annual surcharge of $1,000 for three years. $230 will be paid to the Intoxicated Driver Resource Center (IDRC). $100 each will go to the Alcohol Education and Rehabilitation Fund (AERF) and the drunk driving fund. $75 will go to the Neighborhood Services Fund. There will also be a driver’s license suspension for three months. Considering these penalties, it behooves a driver to do whatever he or she can to be acquitted or have the charges reduced or dropped. As the trial date approaches, a good attorney will help the client get ready to testify. The attorney will walk the client through the testimony with examples of the questions that will be asked by both the defense attorney and the prosecutor. There is the possibility that the judge will also ask questions. These practice situations can go a long way in helping a client feel relaxed when testifying and not let that natural fear and nervousness lead to mistakes. These sessions should be taken seriously as they will give a guideline of what to expect when the actual time to testify comes. Most people are accustomed to courtroom dramas on television and in the movies and think it will be a similar dynamic when their own trial takes place. While the cast of characters might be the same with the judge, prosecutor, defense, court stenographer and police witnesses, there won’t be any dramatic moment with a confrontation. Before the trial, you will likely have been in court at other junctures for hearings in advance of the trial. This should assuage any shock as to how the courtroom appears. At your DWI trial, you will be advised to dress professionally without any gaudy jewelry. You will have your chance to explain what happened at the time of your arrest. When your lawyer begins questioning you, the entire testimony will have been reviewed beforehand. The only difference is that, in court, it will be on the record. In other words, it counts. Your attorney will try to place you in the best possible light and give a reasonable explanation as to what happened. Then the prosecutor will ask a series of questions designed to undermine the defense and help prove the case against you. Your attorney will advise you to listen to each question and allow the questioner – whether it’s the defense attorney, prosecutor or judge – to complete it before replying. If there is confusion, it’s fine to ask that the question be repeated. Prior to answering, think carefully about the reply. Only give as much information as is necessary. There is no need to be expansive unless directed to do so by the judge. The testimony is the defendant’s chance to give a plausible explanation for the DWI arrest such as a medical issue causing the failure of the field sobriety test or that the traffic stop was made without good reason. The penalties for a DWI conviction are expensive and long-lasting. If there is a chance to be acquitted, the defendant should do everything in his or her power to achieve that end. It is important to be fully ready to testify so there are no mistakes made due to a lack of understanding as to how the process works.